A. I'll always restock the item. Pls msg/email: jiejie5818(at)gmail.com for retock timing. Thanks. A. Pls email: jiejie5818(at)gmail.com. If you optioned for normal mail, pls check your letterbox first! Thanks. Seller not responsible for any lost / damaged mail by using normal post service. Usual Shipping period: Normal Mail WITHOUT tracking number: 3-5 working days(some mails may delay up to 3 weeks due ro post office processing). Registered Mail WITH tracking number: 1-3 working days. Delivery Method: Normal Mail WITHOUT tracking number: Letterbox ONLY. * Postman should issue a slip for self collect if parcel is too big to fit in the letterbox. Registered Mail WITH tracking number: Doorstep. Self collect at post office if delivery failed(no one answer door etc.) Only about 50% will receive the slip. Do check to the nearest SingPost branch to retrieve the parcel. Parcel send via Normal Mail gets lost/damaged/stolen is high, a percentage of 2% to 4% and NO WAY to trace. Seller not responsible for any lost / damaged mail by using normal post service. Highly recommended opt for Qxpress/Registered Mail to eliminate the risk. 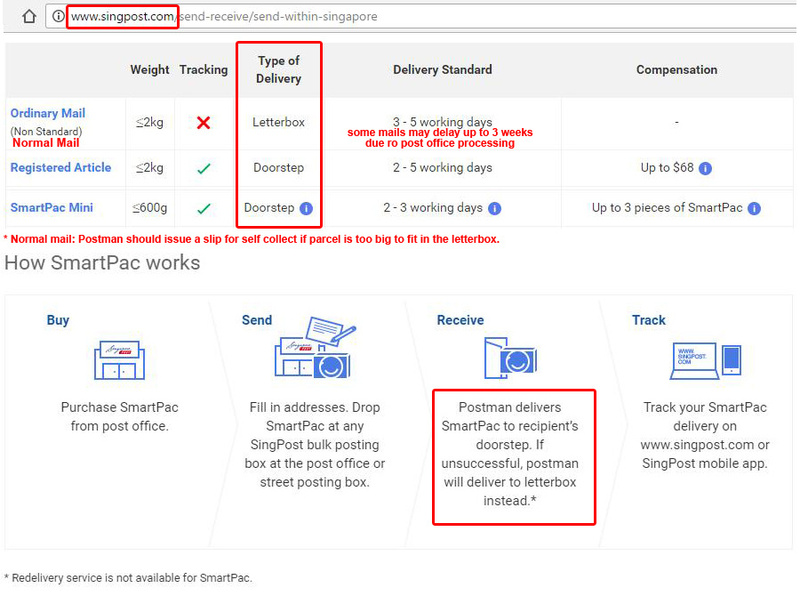 Note: If you option for Singpost Normal/Registered mail, Pls DO NOT require 'call before delivery or leace parcel at doorstep/neighbour' etc. as Singpost doesn't provide such service. Thanks!